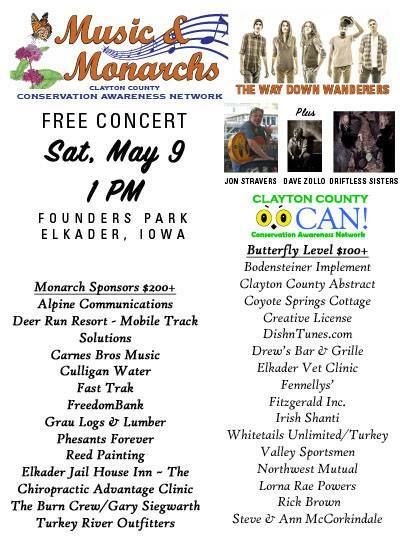 Make plans to come celebrate with us on the banks of the Turkey River in Elkader, Iowa May 9th 2015. A free concert Saturday afternoon from 1-7PM in Founders Park featuring the up and coming bluegrass band, “The Way Down Wanderers” with special appearances by Jon Stravers, The Driftless Sisters, Dave Zollo, and local performer Sophia Landis. Sponsored by the Clayton County Conservation Awareness Network. The event will draw attention to the habitat needs of the rapidly declining monarch butterfly population and what each of us can do to help this and other species by restoring critical habitat. Free milkweed plants, the host plant of the monarch, will be available. ← Register Today for Free Spring Workshops!